If you are using iphone or ipad, you need to download the APP-APP IUSB PRO that the behind BOX SCAN OR CORE APP STORE. When you first insert our SD card reader, it will pop up under the tips. As long as you follow the steps, go to your "application store" download application "APP-IUSB APP PRO," installation. If your iPhone can't read the card, remember to download the APP "APP-IUSB APP PRO". 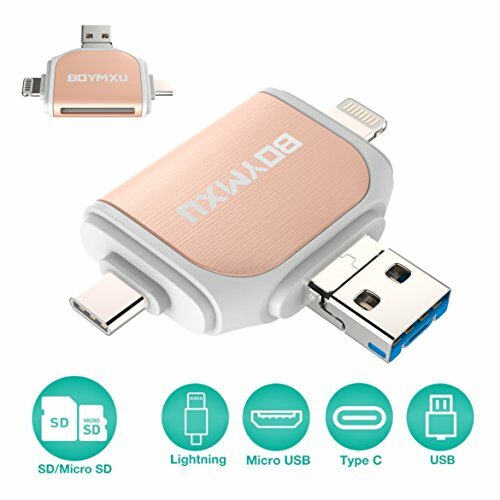 Memory Reader for Multi Devices,card reader is designed with 4 interfaces,Lightning connector for iOS devices-iphone & ipad, Micro USB connector for Android Phone devices,TYPE-C connector for USB C devices like as Samsung Galaxy S8 S8+ New Macbook Pixel XL Nexus 5X 6P LG G5 G6 V20 Pixel 2 XL and other usb-c device. Due to workmanship, there is a slight color gap between gold and the box and the actual item. Ensure 100% compatible and syncs with lightning devices, can be used as iPhone X iPhone 8 7 6 6s Plus 6 Plus 5s 5c 5,iPad Air Air 2 mini ,Android ,type c Etc. If you have any questions about this product by BOYMXU, contact us by completing and submitting the form below. If you are looking for a specif part number, please include it with your message.